Left to right: Rainbow Bright Bandage Skirt, $48, available at Nasty Gal; Blue Crown Rainbow Flip-Out Sunglasses, $9.99, available at Tilly's; Chika Sandals, $150, available at Irregular Choice; Chola Sugar & Spikes Necklace, $350, available atOpening Ceremony; Satine Julia Trouser, $425, available at Satine. Left to right: Lucca Couture Colorblock Bustier Cutout Dress, $69, available at Urban Outfitters; Deena & Ozzy Oxford Stripe Wedge, $59, available at Urban Outfitters; Color Wheel Necklace, $44, available at Yellow Owl Workshop; Multi Colour Block Ankle Socks, $6, available at Topshop; Yellow Colour Block Tee Dress, $100, available at Topshop. Left to right: Staring at Stars Blanket Stripe Skirt, $59, available at Urban Outfitters; Ettika Triple Stack Multi-Color Satin Cord Bracelet, $70, available at Couture Candy; Ombré Colorblock Top, $17.80, available at Forever 21; Rainbow Ankle Socks, $0.95, available at Forever 21; Deborah Lippmann Happy Birthday Nail Polish, $18, available at Deborah Lippmann; Jeffrey Campbell Two-Tone Sandals, $99, available at Pixie Market. Left to right: Frock! by Tracey Reese Laurisa Dress, $238, available at BellJar; 6-Pack Of Stud Earrings, $3.95, available atH&M; Asos Leather Color Block Satchel, $129.29, available at Asos; Winston Colour Block Espadrille Wedges, $100, available at Topshop; Mesh Low-Calf Sock, $6, available at American Apparel; Tulip Skirt Dress, $79.99, available at Zara. 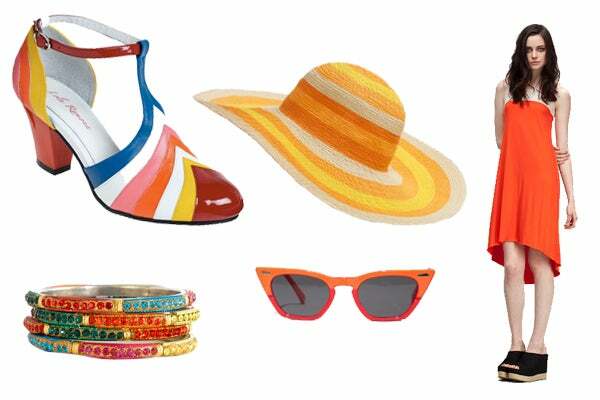 Left to right: Painted Love Heel, $174.99, available at ModCloth; Chamak by Priya Kakkar Crystal Bangles (Set of 4), $65, available at Nordstrom; Kate Spade Stripe Straw Hat, $53, available at Kate Spade; Spitfire Two-Tone Cat Frames, $34, available at Pixie Market; Aiko Petal Tank Dress, $189, available at Dear Fieldbinder.